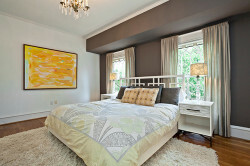 Munger Place Home Offered for Sale in Munger Place Historic District by Douglas Newby, Realtor. 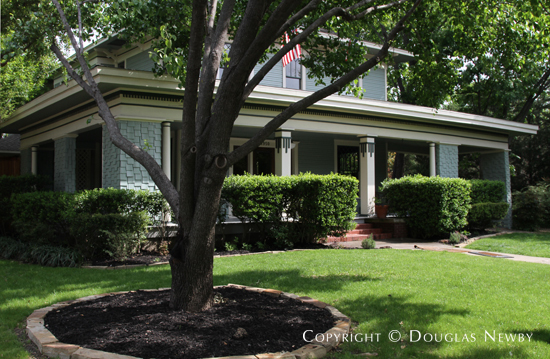 In the heart of Munger Place, this 100-year-old home with a wrap-around porch and porte-cochere conveys all of the aesthetic attributes that propelled Munger Place as the finest residence park in the Southland when it was built and then as the first single-family historic district in Dallas. It is rare that the original craftsmanship, moldings, beams, and trim of a home survive 100 years and they have in this renovated home. The wood floors, wide passageways, and tall ceilings celebrate the original character of the home and its innate architectural modernity and its style was inspired by Frank Lloyd Wright. The adjacent Munger Place lot will be sold and the buyer is required to build a historic looking home with the height and setbacks of the original deed restrictions of the neighborhood. While many neighborhoods are disrupted by large or unsightly homes being built, you are protected by the Munger Place historic ordinance. Because this Munger Place home is on a larger lot, it can easily accommodate the 3,500 sf home with large formal rooms and four bedrooms and three baths, with the added benefit of guest quarters. The porte-cochere provides covered parking next to the house in lieu of a detached garage. The listing prices of similar sized homes found in lesser East Dallas neighborhoods are much higher than the listing price of this home. 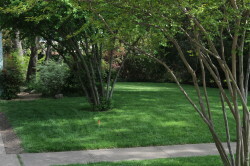 Munger Place is the finest Old East Dallas neighborhood, designed as the most expensive neighborhood and is and has been home to many of Dallas’s leading citizens, professors and business people. Very seldom does a home of this quality become available in Munger Place. This oversized lot gives this historic home with a wraparound porch and porte-cochere an even more elegant sense of proportion. Across the street from a restored home and sharing a corner with one of the first homes built in original Munger Place.